Johnny plays his guitar in Monterey. 1964. John Pappas, whose real Greek name is Ioannis "Yiannis" Efstathiou Pappayiorgas (sometimes also spelled "Papayiorgas"), was born in San Francisco and raised in a Greek-American household. His father comes from the village of Kandyla in Mantineia, Arkadia, Greece (in the Peloponnisos). His grandfather's village is Mpotia (now Palaiopyrgos), also in Mantineia, Arkadia, Greece. John grew up with music and dance around the house. His father, Stathis (Efstathios) had an old 1910 bouzouki as well as a guitar and a mandolin in the house. John's great-uncle also played floyera, and John grew up "fooling around" with floyeres made by his uncle. 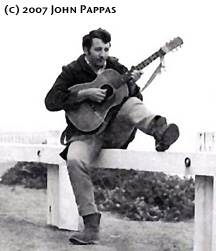 John began playing bouzouki (on the 1910 Graitsi bouzouki) around 1958. He began playing klarino around 1962. He started his first band, the Meraklides, around 1961. As he was growing up, he also learned many of the most common pan Hellenic dances, as well as some of the regional dances from Arkadia, Crete, and Epiros. An interest in international folk dancing led him to the College of the Pacific Folk Dance Camp. He began teaching Greek dances around 1963, and first taught at the College of the Pacific camp in 1967. He has taught at major camps and institutes all over the United States, and in Canada and Mexico. In 1976, he was invited to teach the Greek dances at the Smithsonian's USA Bicentennial Festival in Washington, DC. There, he also performed as a musician and dancer representing "Old Ways in the New World." Johnny plays his new bouzouki in 2006. Piraeus, Greece. John was also a member of the Bay Area Byzantine Chorale for several years. He was the Choreographer for Men's Dances and also the Musical Director for the Greek Folk Dance Performing Group of the Byzantine Chorale. He also did Greek choreographies for the famous Duquesne University Tamburitzans, and also arranged and taught the Greek music for their Greek suite. After the Meraklides, John started a new band, T'Adelphia, which still performs to this day for festivals, shows, dances, weddings, baptisms, and other Greek parties and celebrations. T'Adelphia includes his brother Dimitris (Jim Pappas), koumparo Yiorgis (George Doukas), wife Pavla (Paula Pappas), and son Stathis Pappas. John plays klarino and bouzouki, but also plays several other Greek folk instruments including Karamountza, Lagouto, Baglamas, Santouri, Daouli, Floyera, and Gaida. He has made several recordings of authentic Greek folk music including a series of eight dances for Michael Herman's Folkdancer label, and his current series of three volumes on CD. John has a Master's degree in English literature and taught at San Joaquin Delta College in Stockton, California, where his classes included English and Introduction to Folklore. He also has taught Greek Civilization and college level Greek Folk Dance classes. For sixteen years, John was also the varsity soccer coach at Delta College. He retired from Delta in 2005. His publications include many Greek dance descriptions, several articles, and a book collection of Greek dances and related information. He is currently working on the 2nd edition of his Greek dance book.